Downhill ball rolling in a giant inflatable sphere can be experienced all over the world thanks to two Kiwi blokes, Andrew Akers and Dwane van der Sluis, who invented the craze in 1994. 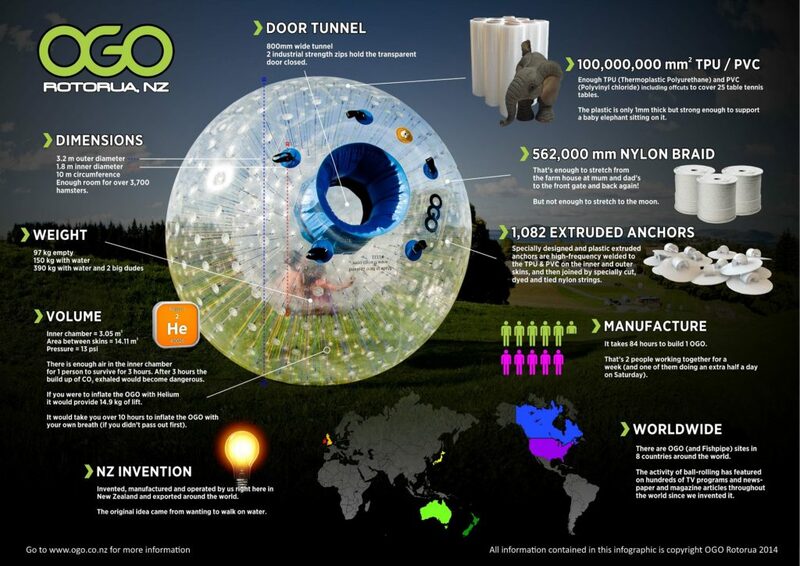 Now OGO New Zealand is owned and operated by Andrew and his brother David in Rotorua, New Zealand. All our OGO’s are manufactured in our Rotorua factory and exported around the world. “The idea started out as a way of playing on the beach and being able to walk on water. The problem was, you couldn’t control it, and we were worried you’d end up floating off to South America…so we started rolling people down hills instead,” says OGO (Outdoor Gravity Orb) owner and operator, Andrew Akers. Constructed in Andrew’s garage, the pair called their double skinned inflatable sphere invention, the “ZORB”, and began trading in December 1995. A temporary site was set up in Auckland until the first permanent site was established in 1997 in Rotorua, where Andrew’s brother, David Akers, joined the business to help run operations. With two other investors, they created ZORB Limited, and set to work commercialising ball rolling, and later setting up their own franchise network around the globe. In 1999, Dwane exited from the company to return to his career as a software engineer, while Andrew continued to run the company as CEO. Unhappy with the direction of the company, once a number of professional investors got involved, Andrew and David exited ZORB in April 2006. Fast-forward to 2010, the Akers brothers set up their OGO operation in Rotorua on the 17 acre original ball rolling site owned by local iwi – Ngati Whakaue. 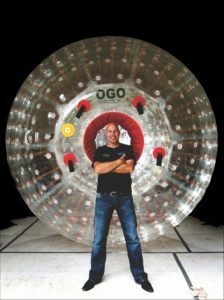 To the layman, the OGO is much the same as the ZORB, but the company focuses much more on continual product development and a holistic approach to the experience, explained Andrew. This was their second chance to “do it the way we thought it should be done without being hamstrung by lawyers, accountants or professional money-men.” . 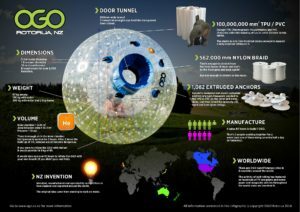 Locally owned and operated, OGO Rotorua is the world’s largest downhill ball rolling park. Situated overlooking the spectacular views of Lake Rotorua and Mokoia Island and is a slice of Kiwi ingenuity that has been recognised throughout New Zealand and the world. NZ invention: Invented, manufactured and operated by us right here in Rotorua, New Zealand and exported around the world. The original idea came from wanting to walk on water. Andrew and David export the OGO and the Fishpipe internationally into North America and parts of Europe and Asia. North America is OGO’s biggest international export market – we have a sister company in Tennessee called Outdoor Gravity Park who operate with OGO branded equipment that we supply them with. Worldwide: There are OGO (and Fishpipe) sites in eight countries around the world. The activity of ball rolling has featured on hundreds of TV programmes, in newspapers and magazine articles since Andrew and Dwane invented it. Outer layer: Enough Thermoplastic Polyurethane (TPU) and Polyvinyl Chloride (PVC) including offcuts to cover 25 table tennis tables. The plastic is only 1mm thick, but strong enough to support a baby elephant sitting on it.